A new cafe on Stanley Street in Central, right at the entrance of Lan Kwai Fong will open its door tomorrow after I heard a rumor for months. Tracy Kwok, the 1st HK Grand Barista Champion, moved from Epoch in Taikoo Shing to here. From the grapevine, it sounds interesting, ie roasting on site or locally roast and nice baked goods. Only after the visit we will know. Somehow, I associated the name of this cafe with holy cow but that's just me, I guess. Just been to Holly Brown had some espresso and latte done by King, Tracy, and Scottie Callaghan. They have very much a milk based blend, and in my opinion, kinda boring. perhaps it's just me. 發表於: 星期五 七月 09, 2010 11:05 pm 文章主題: I was there too. I had two ristrettos today at Holly Brown, one its default blend and the other its weekly/special blend. I wasn’t lucky as Boris to get the one pulled by Callaghan. The first one was pulled by one of the barista; the special blend by Tracy Kwok; both are good pulls. 1 similar tasting note, 2 blends in 1 country, 2 systems land! Both blends are quite similar, smooth with layer of taste and nice ending, a great departure and, yeah!, a nice change to me from those one note, in-your-face acidity forward espresso I recently had from cafes with Aussie's root. Mind you both style are nice but I think I can live with the traditional style better if I was asked to pick among the two of them. One thing is that I don’t know what’s in both blends but, judging from the nutty aftertaste, the usual suspect is Brazil which is quite common for Italian style blend. The roaster is Italian, according to Tracy. Tracy, is this Illy again? Its default blend had a sort of citrus/flowery ending. I think of Illy when I had the drink and I guess this may be how Illy should taste like 3 days after roasting. The special blend has a slightly more pronounced citrus note but still maintains layer, body and smoothness. A ordinary regular coffee that I am long for! Like Boris said, both blends will not wow you but kinda bring me back on how coffee typically tastes like. So, don't expect surprise, just a good old familiar coffee with no bitterness that was easy to enjoy in a lively cup. To me, this is a good job and those who like Illy so much should try this coffee once. I haven't had a chance for any milk drink due to time limit so I’ll be back again for sure. For the ambience, it's like a souped up version of Epoch, hipper, livelier, more happening vs. a used to be hip/dated that Epoch has. This is the kind of cafe I've been looking for, the cafe that both cares for its design and its coffee. For those that get a bit serious, Holly Brown roasts the bean ‘on site’ with a five kilo roaster. You can do a detective work on what they put inside the blends with sacks of green bean lying pretty close to the roaster. I saw some Brazil, monsooned, and Guat, IIRC. However, Tracy told me they have more sack somewhere so you can’t do all the guess work right. Will they be mad? Will there be war? Just another machine with difficult to pronounce name... but it's pimped! Sort of! The machine is what Cafe Little use, Victoria Arduino; however, this is not those "antique" looking thing pull down like what Cafe Little uses but more of a traditional style with matching grinder. The taste profile is like other espresso machine and nowhere near the superb clarity you get from Synesso. I’m still waiting who will be the first to use Synesso in the cafe. Do I recommend this cafe even after a short test? I do. At least it will please cake and ambience crowds for sure, a nice change from those fatigue look, barely there decoration Indie cafes typically associated itself with and not as stuffy as Fuel Espresso at IFC. You have a decent place to sit and relax, talk businesses and gazing people with a good coffee to boot. For the coffee, I can only say it's a nice change from the acidity forward coffee and will need to confirm more on my next visit. But I kinda have some hope here. Pricing: single/double espresso/ristretto HK$20/HK$24... compare this one with an excellent location to Yu-E Cake+Cafe in Tin Hau for HK$38 for espresso with 20% robusta in the blend... Enough said! I was when I knew the machine combo few weeks ago. given the huge money to burn, they could easily managed to get a synesso, or even slayer to wow the whole coffee industry. Now I tried their coffee and seems getting their position. They are not going to be pioneer and lead the front-end, they just want be a Starbuck at it very very very best - super cosy env with traditional and high quality coffee. They are not going to be pioneer and lead the front-end, they just want be a Starbuck at it very very very best - super cosy env with traditional and high quality coffee. Still, I see it a nice stepup they took from what Epoch left and I hope this could be a new place for ladies who lunch too. If these people with $$$ to spend get hooked to the good quality coffee, even in the milk, I hope it will spill over to the coffee requirement of general public which really means there's more $$$ to be made in this market. A good thing for us coffee enthusiast, isn't it as they will finally find way to differentiate, ending up with the real good roaster and the like here in Hong Kong. 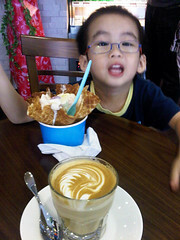 I tried their ice-cream and latte today with high expectation. The ice-cream (with mango and strawberry) is great, but the "cone" is a bit hard and not crunchy. The latte is a bit disappointing, I can only taste bitterness but other favor is a bit too weak, the milk frothing and latte art is great and temperature is about right (warm but not hot), but they seems using Greenfield milk of which is not as tasty as Pura or Kowloon Dairy. The worst part is in the espresso, I suspect either the bean or the brewing may still have room to improve and fine tune. I can only rate it above Pacific coffee and Starbucks and on par with Habitu for this visit. But with the pricing of $34 for a small latte and $48 for medium size ice-cream make it less attractive. I still think Barista Jam is the best in quality and value for money in Central and Sheung Wan region. 發表於: 星期六 七月 17, 2010 4:28 pm 文章主題: Finally a nice place to have a good coffee. Tried one more time today and think it's very good though it will not wow coffee geek, ie sweet with some citrus/orange peel note and some dark chocolate for its double ristretto house blend. The house blend is quite easy to drink and, to me, good for both beginner and advance who don't mind let coffee be coffee. Its special offering in single ristretto was not my cup of tea, a bit more of everything except the sweetness which seemed to be disappear from the equation, ie like very dark chocolate you find it difficult to drink. These two cups were brewed by one of the barista with goatee while King becomes a cashier... ? My cappuccino from Tracy was nice with more pronounced coffee flavor, much better than Epoch for sure. Spot on temperature and milk texture are also Tracy's signature, an exquisite latte art to boot. The accompanied/free at the bar biscotti was surprisingly good. Its croissant wasn't as good as Crema, not flaky and buttery enough. In all, I can recommend this cafe. Don't expect the world but let coffee be coffee. My concerns/hope is that they can stay in business for long considering the rent and their food offering, ie no hot breakfast bar which they could charge more for that. I am lucky that this evening King is making the drinks for us. Tried their different blends too. I like very much their stronger blend for making espresso, and also the piccolo is good too. I found the strong blend they're now using is different from what I've tasted so far. It's a brand new espresso experience to me. I have been to holly brown a few times already and had mixed results - good old italian style, overextracted, underextacted, and totally flat. Hope they are just doing experiment on blending and extraction as I really think consistancy is very important esp. a coffee shop of this scale. On that evening, I had chatted with King. When he asked me to try the stronger blend to make the espresso, he made the first one which he knows is not so good. He let me try is it's too watery and lack of flavours, and I think it's underextracted. Next pull with the same bean, but different ground and tamping, it is very good. It is abundant with citrous flavour, and bitter too. It's very thick and slowing flowing within the mouth. The aftertaste is also very longlasting. In the afternoon (not by Tracy and I don't know who made it for me), I can't recognized its SO and it's more like the coffee was ground for a long while back with a strong bitter note and blond crema (totally different from the brownish in the morning), reminding me of Illy's I had at Epoch which means not good, a lifeless soul of what used to be a great cup. I got a second cup SO delivered to me by the roaster himself (forgot his name and thank very much for the cup) and it's Sumatra. While it's very nice with lots of exotic note and orange rind/peel aftertaste, there's a bitterness in this ristretto. The latte was also quite hot with no particular milk sweetness and it tastes quite milky. I suspect more of the machine's temperature as the culprit. As if I sound like a cheerleader to Holly Brown, after all this, I still think the cafe is a good decent place even though it still needs some finetuning. It's much easier for me to drop by this place due to the location and nice deco gives another advantage to other Indie cafes. may be all good baristas they mentioned above. all left. today C H is more aggressive ?